BANGI, 2 Dec 2013 –The National University of Malaysia (UKM) is wooing the private sector to take part in student exchange schemes, especially the Outbound Mobility for its students going abroad. Deputy Vice Chancellor (Academic and International Affairs), Prof Dato’ Noor Azlan Ghazali called it a “Country Window” whe with sufficient funding there is a good opportunity for more UKM students to experience university life in other countries. Speaking at the launch of UKM’s International Relations Centre (IRC) Mobility Day forum and exhibition here today, Prof Noor Azlan said UKM can give partial support to its students taking part in the Outbound Mobility programme but needs more funds. He urged PHA to procure additional financing through participation of corporate entities as sponsors for the programme. The Outward Mobility programme is an opportunity for UKM students to take part in academic programmes and experience life overseas for at least one semester or six months. Student mobility involving student exchange programmes is one of UKM’s strategic priorities. It is coordinated by the IRC in collaboration with various UKM faculties and institutes. 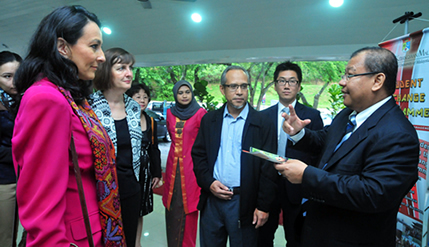 So far UKM has mobility programmes with the University of Duisburg-Essen in Germany, The Asean University Network (AUM), the ASEAN International Mobility for Students (AIMS) programme, Flinders University of Australia, Ablai Khan University of Kazakhstan, Korea University of South Korea and various other foreign universities. In his welcoming remarks, IRC Director Prof Dr Imran Ho Abdullah said the mobility programmes with Duisburg-Essen and ASEAN universities have seen the most participants. He said with support from the IRC students can conduct research and form attachments with industries in foreign universities, laboratories and companies. Prof Imran said UKM also receives many international visitors, mostly from overseas organisations and universities each year. The programme is the best way for both parties to exchange ideas and to build the international network. IRC acts as the liaison and coordinators for the international visitors. In the forum, guest speakers from foreign embassies gave presentations about opportunities available for further education in their countries. Karen Welsh, Education Counsellor at the Australian High Commission said universities in her country have seen a rise in the number of Malaysians doing post-graduate studies forboth the Masters and Doctorates programmes. She said there was now a shift away for Malaysians doing basic degrees in Australia to more advanced course works that allow them to work there. Lourdes Sosa Marquez, Deputy Head of the Mexican Embassy said her country is not yet a familiar destination for Malaysians wishing to study abroad but some headway has been made through student exchanges and mobility programmes with UKM. Marquez said anyone wishing to enter a university in Mexico must be proficient in Spanish and attend the language and cultural courses first before attending. Chung Chi-Won, the Second Secretary of the South Korean Embassy said because of his country’s fame and popularity among Malaysian youths, there has been an increase in inquiries about tertiary education there. Chung advised applicants from Malaysia to have at least STPM level qualification and sign up for a Korean language course before applying.